Organising your wedding can be incredibly stressful. You have to buy the dress, organise the reception, choose the flowers and sort out the wedding breakfast. But, what many couples neglect is how your guests will get to the wedding ceremony and then on to the reception and evening festivities. This is something that needs careful consideration, especially if your relatives and friends are travelling from far away or are disabled or elderly. This is when wedding coach hire in Birmingham becomes incredibly beneficial, for both you and your guests. One of the biggest benefits of hiring a coach for your wedding is that it brings everyone together. A wedding is a time for celebration and relatives that haven’t seen each other for years will have the chance to sit and catch up. Choosing a coach from AVTL Coach Travel will allow all of your wedding guests to sit back, relax, mingle and enjoy the journey together. Our coach hire service is a cost-effective way to get everyone to the church on time, as well as being hugely convenient. Taxis can be expensive, so when everyone clubs together towards the cost of a coach hire service, ultimately everyone will save money. Another option that many betrothed couples choose is gifting the cost as part of a thank you to your guests for sharing in their special day. When you have elderly relatives who have reduced mobility, or relatives with a disability that results in the need for a wheelchair, accessible coach hire is a must. At AVTL we also offer mobility coach hire that comes with a full hydraulic wheelchair lift, same-level, onboard toilet facilities, reclining seats with seatbelts, plus hot and cold drinks facilities. This is so much easier than trying to organise a taxi or to arrange lifts with other family members. 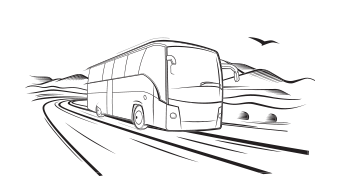 Coach hire with AVTL takes all the stress away. Weddings are all about decadence and enjoying yourself, and it’s important that this extends to the travel arrangements. Coach hire is comfortable and allows everyone to travel in a relaxed manner. No one has the pressure of driving through an unknown part of the country or trying to find a parking space. Your guests will arrive fully refreshed and relaxed. One of the biggest concerns for the bride and groom is that of guests arriving late. This is often down to driving in an unknown area and not knowing where to park. Of course, this is also a huge concern for your guests. A wedding coach hire service ensures that there is no delay to your proceedings as everyone will arrive in plenty of time. Finally, when you hire a coach for your wedding guests then you are guaranteed a seamless service. Your guests will be delivered to the church from a designated pick up stop, or several stops if needed. Guests will then be able to travel by coach to the wedding breakfast or evening reception. This will make the entire day run smoothly, and be less stressful for everyone involved. To learn more about our wedding coach hire in Birmingham service, then please do get in touch with us today. Find out more about our Coach Hire Services. Check out our service page for more information.